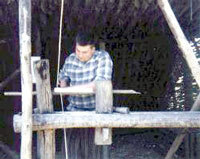 The pole lathe is one of man's oldest woodworking machines. Powered by the turner's foot, a cord, and the springiness of a green wood pole, a pole lathe could be set up anywhere in the forests and used to turn green wood products on the spot. They were used by bodgers, skilled craftsman who made wooden chairs and a lot of other forest products from greenwood using a pole lathe deep in the woods. They're still used today by modern-day bodgers. Green woodwork uses fresh-cut poles and cleft wood rather than seasoned sawn timber and planking. Green wood "works" differently, bends more easily, cleaves well, allows for glueless joints, and cuts well on a pole lathe. Windsor and ladderback chairs are traditionally made of green wood. Other products are stools, hurdles, tent pegs, spoons, tool handles, rolling pins and more. Once fashioned, the wood is dried in a simple kiln. Pole Lathe Turning -- 2,800-word article on pole lathes, what they are, what they do, how to use them, and how to build one, with diagram. "Green Woodworking: A Hands-On Approach" by Drew Langsner & Carol Taylor, 1995, Lark Books, ISBN 0937274828.